It’s great to be off to a fresh start in politics, isn’t it? Out with the old; in with the new. Barack Obama is in the fourth quarter of his presidency but he’s not going out quietly. Politically liberated by his lame-duck status, he’s gone on the policy offensive, exercising his executive authority in bold ways. Congressional Republicans are countering with their own plans to reaccelerate deportations, deny anthropogenic climate change and prolong the isolation between Cuba and the U.S.
Speaker John Boehner’s invitation to Bibi Netanyahu to address a joint session of Congress on the dangers of conducting multilateral nuclear diplomacy with Iran is a particularly bold move. I guess we can forget about the old standard that our political differences end at the water’s edge and the president is in charge of foreign policy. The Boehner gambit looks to me like a sop to Sheldon Adelson, the casino magnate who spent $150 million in campaign 2012 and squired Mitt Romney around the right-wing salons of Jerusalem. Adelson also publishes Israel Hayom, a hawkish free daily that is destroying the newspaper marketplace in Israel, and is known as a shill for Netanyahu. Meanwhile, concern about income inequality has become a fashionable new position among national Republicans. Mitt Romney has joined Ted Cruz, Marco Rubio and Rand Paul – even John Boehner and Mitch McConnell on “60 Minutes” – in criticizing Obama’s failure to stem the 40-year capture of American economic growth by the one percent. I guess you have to embrace the irony. Maybe their faith that the American electorate is too scared, angry or befuddled to unravel this bit of political jujitsu will be vindicated. 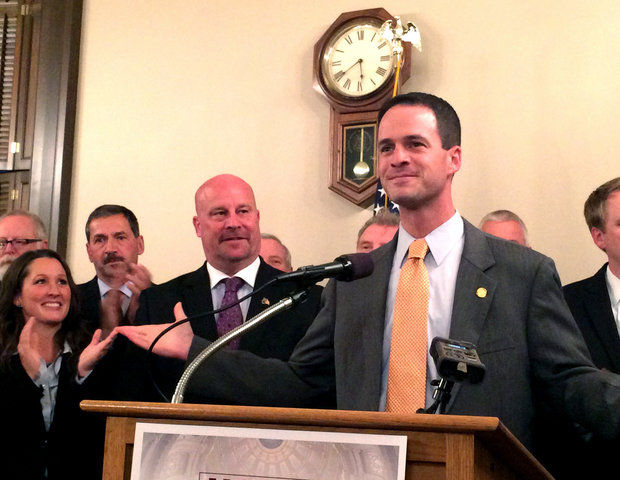 In Lansing, détente didn’t survive committee assignments. New Speaker Kevin Cotter punked House Democrats on their choice for a minority vice-chair for Appropriations, and established that he’s had it with “politics.” Mr. Cotter has demonstrated that he’s firmly in charge and Democrats should get accustomed to capitulation, not compromise. On the Senate side of the Capitol, Majority Leader Arlan Meekhof has resumed his quest to eliminate Michigan’s prevailing wage law. In his calculus, downward pressure on working people’s wages is good for the economy, and he, for one, doesn’t appear to be perturbed by income inequality. Besides, repealing prevailing wage has great symbolic importance to his west Michigan patrons in their crusade to annihilate unions. Gov. Snyder has said prevailing wage isn’t on his agenda, but we’ve heard that before. Snyder tried his hand at poetry with his River of Opportunity allusion in his State of the State address. Until evidence shows otherwise, I guess we have to take him at his word that this reinvention is all about better serving Michiganders who need assistance to build a better life. Still, there is some suspicion that this reinvention is more a mechanism to pay for those corporate tax credits that have blown a nasty hole in the State’s budget. The governor’s relentless positivism looked a little silly when he described the sales tax ballot initiative as “a lot of smart people’s” idea for how to fix the roads. That’s a real stretch. You’d have to do some real scheming to come up with a more regressive funding mechanism. The alternative plan that was based on an indexed wholesale fuel tax would have done much better on the smart-policy index at this time of almost unbelievably low gas prices. The proposal that’s going to the ballot is the best that could be negotiated with Republican ideologues who don’t care what Business Leaders for Michigan, or anybody but the conservative roots and their funders, thinks. If the early polling means anything, the proposal is in serious trouble, if not stillborn. Snyder has a challenge much like Barack Obama's: How do you get a contemporary Republican legislative body enthused to do anything besides shrinking government until you can drown it in the bathtub? Tax cuts will not induce industry to invest, hire and grow. Only demand in the economy will do that. Expansionary fiscal policy – overdue investment in basic research, education and infrastructure - is precisely what this fragile recovery needs. Unfortunately, that doesn’t appear to be in the playbook of legislating Republicans in Washington or in Lansing. Word out of Palm Springs is that Charles Koch and 300 of his wealthiest confederates are going to raise $900 million for campaign 2016 to combat “collectivism.” That buys a lot of influence with politicians, and a lot of viewers’ eyeballs. Does that make you eager for this next chapter of American political life? This is about as partisan as an article can get. I know Bridge hides behind the banner at the end of every article that the views presented by an author may not match the views of Bridge, but please, if an article is pure partisanship, then do not publish it. Rich, this is not an "article." It's a commentary or opinion piece, similar to every Sunday's Brunch with Bridge content. Like the government in the state of Michigan isn't partisan? I suppose we could all go back to putting our heads in the sand and avoid the massive drain on the economy with creating a society where no one but the extreme wealthy can afford to purchase anything but basic needs. Obama is bold, and Republicans want to lay waste to the landscape! Robinson is a one issue lobbyist and his views did not require reading...just seeing his byline gives a reader a full preview. Bridge is usually better than that, with discussion of issues,alternatives and solutions. This is not a forum for Ted Cruz on immigration or Al Sharpton on race. So please, no more hacks on Sunday morning. This statements made in this essay were admittedly from the liberal or Democratic perspective. That said, however, I read the viewpoint twice and could not find a false statement or error of fact therein. I've heard it said that the truth can sometime hurt. Good column. The Michigan GOP is all about partisan issues of importance to corporations, the wealthy and the TeaBaggers - just look at what they have as their priorities and it's obvious to all who care to look. Fixing our roads? Nope - leave that to the 'voters' and present them with bad choices. Just one of so many important issues that we need leadership on - and didn't get. Agema is the GOP of Michigan - admit it. Instead of interpreting the push to eliminate Michigan's prevailing wage laws as believing that "downward pressure on working people’s wages is good for the economy", perhaps Arlan Meekhoff wants to reduce the financial inequity among contractors. More people with jobs at all means fewer people on unemployment or spending down their savings merely to survive. Right now, prevailing wage means the state and school districts can afford to fund fewer projects, so fewer construction tradespeople have or will get jobs at any wage at all. I'd prefer my tax dollars were spent to provide the greatest amount of leverage possible, so 20-30% more $20/hr jobs than we'd get if we were require all contractors to pay union scale sounds like a smart move to me. The additional 10-20% of projects that we can afford at good vs.gold-plated wages should provide even wider stimulus, assuming Rich Robinson believes the Democratic party line that government spending stimulates the overall economy. If "Rich" has his way and partisan articles that do not "match the views of Bridge" are not published, this will be very boring online publication. And Phil Power's request that I write an occasional piece from the conservative perspective will certainly disappear. Rich Robinson is an articulate, thoughtful liberal/progressive -- and usually wrong. But I want his voice in the policy debate. The proof is in the pudding - Obama's recovery thru fiscal activism and public investment, versus the GOP proposal that is identical and would have had similar results as the path followed by the Europeans and the resultant anemic growth. Notably they are now following the Obama (and Feds) path. Rich is right, I mean correct of course.